Hello! Diana here using some of my favorites from the Classy Cards 'n Such on-line store to make a quick and fun card. I started off with the stitched rectangle from MFT Blueprint 13 (you knew that was coming, right?) and used my Spritzer bottle to just wet the lower left corner of the base. I then used just a little bit of the Pthalo Green color burst. A little goes a long way! While it was drying, I die cut Memory Box Row of Poppies and colored it using watercolor brush pens. After the color burst was dry, I made a diagonal grid cut out using Impression Obsession Square Cutout Border. It gives such a different look just by changing the angle! You can see that I also did it for the inside of the card in the opposite direction. 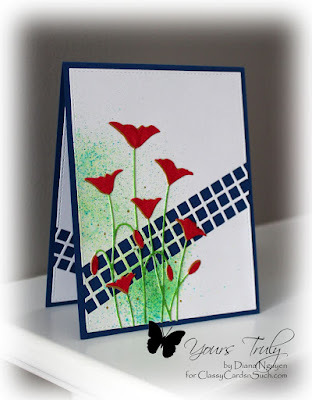 After adhering the poppies to the front of the card using Art Institute glue. For a final touch, I used a gold gel pen on the left edges of the poppies. Love the reverse diagonals. Looks cool mixing the graphic sharpness with the softer floral and watercolor burst.